Rejoice Ye Who Are God's Chosen People! Rejoice! Rejoice Ye Who Are God’s Chosen People! Rejoice! Imagine being one of God’s chosen people! Is it really possible? Is it really available? Special privileges go with those connected to ‘the Top.’ Those highly favored of God Almighty have an indescribable future prepared for them — for eternity. I say ‘indescribable’ because that’s what God’s Word says. If you were the son of a King, don’t you think that your Father would favor you over others simply because of your relationship with him? Of course he would. It’s always family first in God’s thinking and planning. Isn’t the nation of Israel God’s chosen people? I’m not Jewish, and it appears God may have forsaken His people — has He, or are they still His chosen people? Way back near the beginning, God chose the nation of Israel to be His people. He wanted them to walk with Him, keeping His commandments and in return He’s bless them and keep them safe from all enemies. He said that He would give them the land where Israel now is, and a much larger parcel of land than that. But Israel continually walked away from God and did not keep his commandments. They worshiped the gods of the Assyrians, Egyptians and Babylonians. The rejected God’s Word and in turn rejected God’s protection. By the time Jesus was born, the upper hierarchy of Israel’s rulers had become so corrupt that Jesus rebuked them publicly more than once. The heart of God’s chosen people was so disconnected from His heart that He gave them a ‘spirit of slumber’ that they would not believe until the Messiah returned a second time after his crucifixion, resurrection and ascension into heaven. You can read all about it in Romans chapters 9-11. Here’s a portion of that section. Romans 11:1-9 I ask then: Did God reject his people? By no means! I am an Israelite myself, a descendant of Abraham, from the tribe of Benjamin. “Lord, they have killed your prophets and torn down your altars; I am the only one left, and they are trying to kill me”? So too, at the present time there is a remnant chosen by grace. And if by grace, then it cannot be based on works; if it were, grace would no longer be grace. God is so gracious and merciful that He will never cast away his people forever. No, He’s got plans for them and that for good. But for now, God has given Israel a ‘spirit of slumber’ to prevent them from believing, except for the few (remnant) elect He’s chosen now. God has done this to open the door of salvation to the rest of the world, called “the Gentiles” in the Bible. Let’s continue in Romans 11. Romans 11: 11-28 Again I ask: Did they stumble so as to fall beyond recovery? Not at all! Rather, because of their transgression, salvation has come to the Gentiles to make Israel envious. But if their transgression means riches for the world, and their loss means riches for the Gentiles, how much greater riches will their full inclusion bring! in the hope that I may somehow arouse my own people to envy and save some of them. For if their rejection brought reconciliation to the world, what will their acceptance be but life from the dead? do not consider yourself to be superior to those other branches. If you do, consider this: You do not support the root, but the root supports you. Granted. But they were broken off because of unbelief, and you stand by faith. Do not be arrogant, but tremble. For if God did not spare the natural branches, he will not spare you either. Consider therefore the kindness and sternness of God: sternness to those who fell, but kindness to you, provided that you continue in his kindness. Otherwise, you also will be cut off. so they too have now become disobedient in order that they too may now receive mercy as a result of God’s mercy to you. Who Are God’s Chosen People in the Interim? So if God has temporarily suspended Israel’s calling and election, except for a small remnant, who are God’s chosen people today? Does He have any? The answer, straight from God’s heart, the Bible, is YES! Let’s see what God says. To the praise of the glory of his grace, in which he has made us accepted in the beloved. Who is the guarantee of our inheritance until the redemption of the purchased possession, unto the praise of his glory. Wow! If you believe in Jesus, God says that He “chose” you from before the foundation of the earth! That was a long, long time ago — way before any person was made! God’s foreknowledge if unrestricted. He’s not time-locked as we are. He doesn’t predict, he foresees and foreknows. This is beyond our human comprehension but nevertheless it’s true. Here’s another verse telling us what God thinks about those He’s chosen. Romans 8:33 Who will bring any charge against those whom God has chosen? It is God who justifies. Nobody — spirit or human — has the right to bring any charge against God’s chosen. When you belong to God, you are privileged indeed. This relationship with the Creator of the heavens and the earth is available through His Son Jesus Christ whom God sent to save the world. Answer God’s call today. What are you waiting for? You can be ‘blessed with every spiritual blessing” if you just but act. It’s not your fault you were born into this mess called life in a fallen world, and God has provided a way out. There’s a new world coming my friend; one where only good and no evil exists. Do you want to be part of it — forever? You can. Just answer God’s call; accept His invitation. 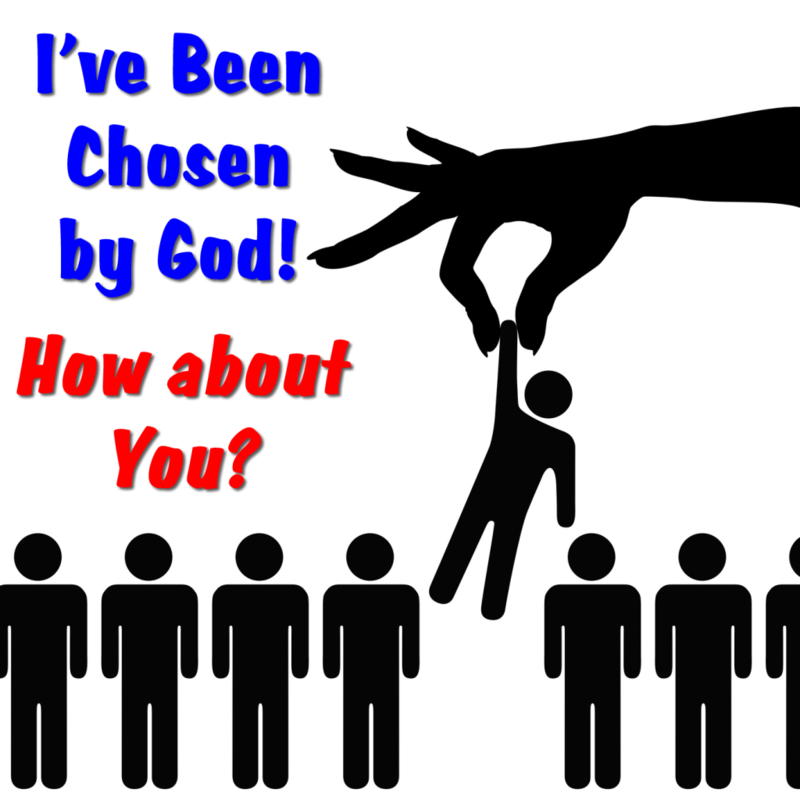 Are you one of the truly chosen of God? « Is the Criminalization of Christianity Here?